Disruption of the pelvic bones takes a huge amount of energy, and results in significant bleeding and morbidity from other causes. Repair typically consists of surgical fixation, frequently with temporary external fixation in the interim. These patients require intensive therapy postoperatively, with inpatient rehab prior to discharge home. 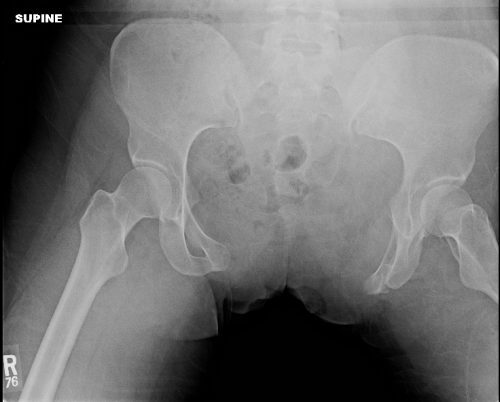 How well do patients with severe pelvic fractures do in the longer term? The group at the University of Tennessee in Memphis did a lengthy followup study spanning 18 years of severe pelvic fractures treated at their hospital. These patients had sustained fractures with significant bleeding, an open book component, or SI joint disruption with vertical shear. The authors used phone interviews and a standardized measurement instrument (Activity Measure for Post-Acute Care, AM-PAC) to gauge daily activity of affected patients. They then looked for factors predictive of functional outcome. Bottom line: Early definitive fixation of the pelvis was the only variable found that had an impact on future mobility and activity. Frequently, external fixation is applied soon after admission. But remember, your trauma patient is at their healthiest as they roll through the doors of your ED. The sooner they get all of their problems fixed, the better (and safer). Impact of early operative pelvic fixation on long-term functional outcome following sever pelvic fracture. AAST 2016, Paper 60.